Unlike wine, this game proves that some things do not get better with age. After the ending of Orochi in '97 and the success of the insane melee of KOF '98, number 99 starts off with a new saga and new fighters. The story starts off after in the 97 tournament was done. Kyo is kidnapped and able to escape from his unknown captors, but not before his kidnappers took some of his DNA to start cloning there own army of Kyo fighters. 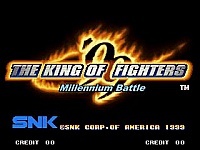 As this is happening, someone takes over KOF and alters the rules a little bit. Now, its 4 members to a team and one of them are assigned to be a 'striker'. Can '99 stay afloat? The character artwork looked mediocre at best; I enjoyed the fighters' pictures and scenery up until '98. 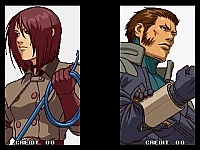 The portraits looked too close like each other and the fighters' animation was the same old thing we have seen in past KOFs, but no feeling of being actually new. I never understood why some people liked the stages in this game. They were simply not that glamorous nor were they stunning. The raining in the park wasn't that graphically amazing and all the other stages were below expectations at best. Seeing the fight take place at an airport, a sewer, and in a plain underground lair.they're fighting here why? I've seen better detailed stages in past KOFs. The atmosphere surrounding these stages felt rather dull and random. 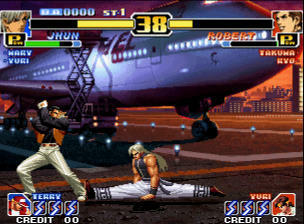 Like if SNK had KOF' 91, these stages would belong right there. As for the striker system and the 4 member teaming, it was different, but not as refreshing then some players wanted. 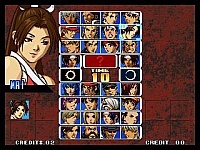 The object was after selecting your four members; you determine which of the three would do active fighting, while the remaining one would be given duty as a "striker". A striker's task was to come out and do a special of sorts, giving his/her teammate a small advantage. Depending on who you use and where you call them to come in was crucial, as each person, who was a striker, had a certain number of stocks so you couldn't abuse the side system. In some cases, it really didn't alter the fun factor whatsoever. For the super meters, you now have three stocks to fill in. Doing a Super costs you one stock, but you will need all three stocks to open the armor and counter modes. The two callings were not as impressive then the extra/advance systems. Sure, they gave extra defenses, canceling specials to supers, and unlimited use of supers for set time, but I found myself not even using the new special modes because it did not cross my mind to even use them. The worst part is after you use these special modes, you lose your super meters for a few seconds, which didn't change the way I battled in this game. 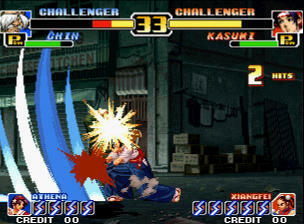 The arcade controls for this game are still very responsive, letting you able to perform the special moves and combos with ease. Going through the special modes trance, however, feel wasteful. This is possibly one of the most forgetful soundtracks I ever heard. It feels like SNK wanted the tracks to sound rough and cool, but somehow someone ignore the part to make them catchy. Even Terry's theme is pathetic. The voice acting is fine to say the least. Nothing too wonderful came from the sound effects section. Same blocking sounds, same hitting sounds, same everything. The announcer, however, don't even talks like he wants to be in the game, like he just come in to work, talk unenthusiastic into his microphone just to get paid, and leave. The new fighters are not what I had in mind. To tell you the truth, the new cast is so and so. Having two Kyo clones taken two spots just seems not needed for me as one would've been enough. 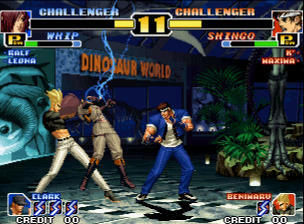 Kyo and Iori are hidden in the game, but you need to have them unlocked. The way they placed the four members across the select screen look terrible. All you got for a journey is take on six teams to fight and then you went straight to the final boss, with the chance of fighting Kyo or Iori in the end. Yeah, it wasn't that exciting as I wanted to be, either in single or versus other people. 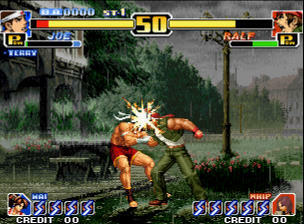 All things on top have to come down sooner or later and for SNK, their flagship series started its downward spiral here in '99. . In conclusion, the quality of this game screams 'average'. There is nothing to make you ecstatic, hyped up, or eye-popping in this game to make you go run, more less walk, to buy it or play it on a daily basis. Truly, a travesty.